Images from the Fairhaven Steampunk Festival: Mr. Flip's Carnival of Wonders & Curiosities on Saturday afternoon July 19, 2014, at Fairhaven Village Green in Fairhaven, Wash. 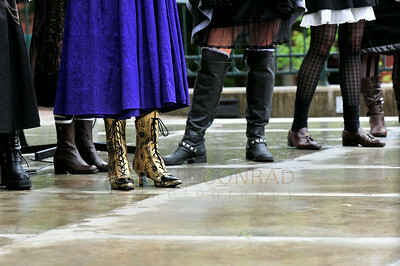 Hundreds enjoyed the sights of individuals dressed in Steampunk Victorian costumes, live entertainment, food and vendors. Mr. Flip's Carnival of Wonders & Curiosities is brought to you by The Bellingham Steampunk Society, the Historic Fairhaven Association and Village Books. © Paul Conrad/The Bellingham Herald - Inocencio Valderrama of Bellingham works his booth during the Fairhaven Steampunk Festival at Fairhaven Village Green in Fairhaven, Wash., on Saturday afternoon July 19, 2014. 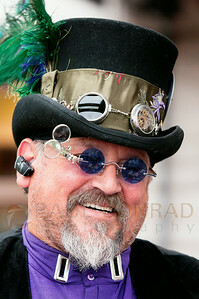 Hundreds enjoyed the sights of individuals dressed in Steampunk Victorian costumes, live entertainment, food and vendors . © Paul Conrad/The Bellingham Herald - Shell Phillhower crosses the stage during costume constest the Fairhaven Steampunk Festival at Fairhaven Village Green in Fairhaven, Wash., on Saturday afternoon July 19, 2014. Philhower says her costume took over 2 months to create and calls it her "Personal Flight Device." 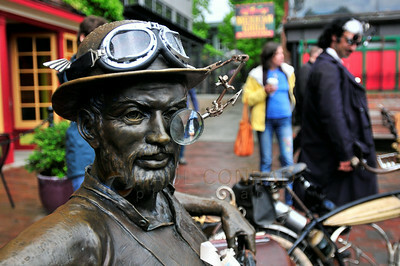 Hundreds enjoyed the sights of individuals dressed in Steampunk Victorian costumes, live entertainment, food and vendors . © Paul Conrad/The Bellingham Herald - Valerie Snelling of Bellingham takes in the surroundings during the Fairhaven Steampunk Festival at Fairhaven Village Green in Fairhaven, Wash., on Saturday afternoon July 19, 2014. Snelling says this was her first time dressing in Steampunk fashion and began working on her costume at midnight. 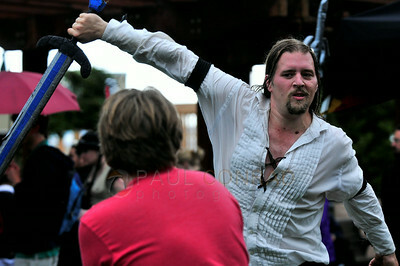 Hundreds enjoyed the sights of individuals dressed in Steampunk Victorian costumes, live entertainment, food and vendors . 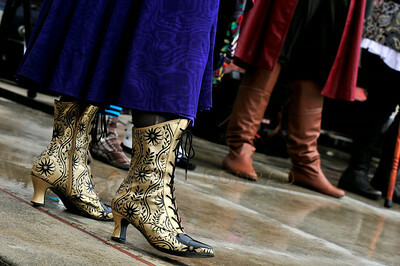 © Paul Conrad/The Bellingham Herald - Golden boots worn by announcer Laura Brisbane stand-out against others during the costume contest of the Fairhaven Steampunk Festival at Fairhaven Village Green in Fairhaven, Wash., on Saturday afternoon July 19, 2014. 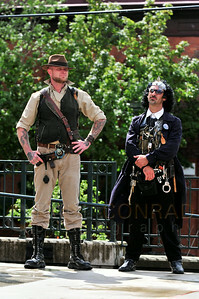 Hundreds enjoyed the sights of individuals dressed in Steampunk Victorian costumes, live entertainment, food and vendors . 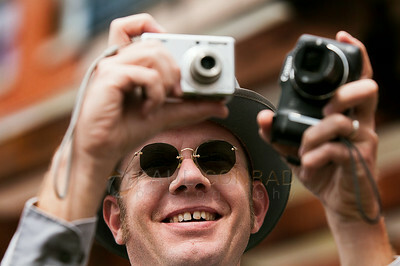 © Paul Conrad/The Bellingham Herald - James Kilpatrick of Bellingham, takes photos during the costume contest of the Fairhaven Steampunk Festival at Fairhaven Village Green in Fairhaven, Wash., on Saturday afternoon July 19, 2014. 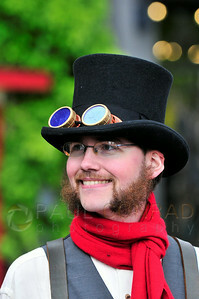 Kilpatricks says he enjoys the Steampunk festivals and this is his third year attending. 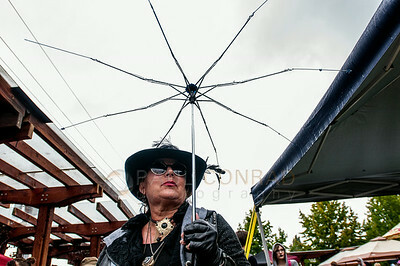 Hundreds enjoyed the sights of individuals dressed in Steampunk Victorian costumes, live entertainment, food and vendors . 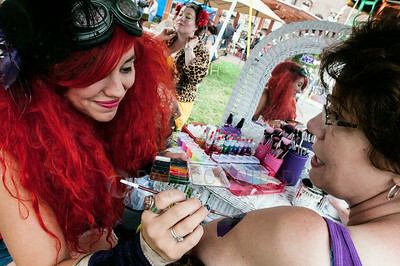 © Paul Conrad/The Bellingham Herald - Make-up artist Aireekah Laudert of Bellingham, left, paints on a tattoo onto the arm of Liz Swartz of Sedro-Woolley during the Fairhaven Steampunk Festival at Fairhaven Village Green in Fairhaven, Wash., on Saturday afternoon July 19, 2014. 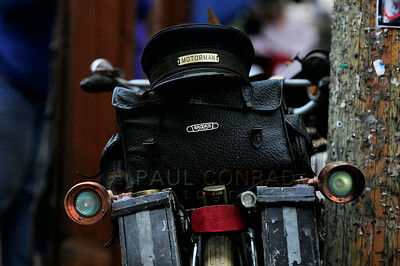 Hundreds enjoyed the sights of individuals dressed in Steampunk Victorian costumes, live entertainment, food and vendors . 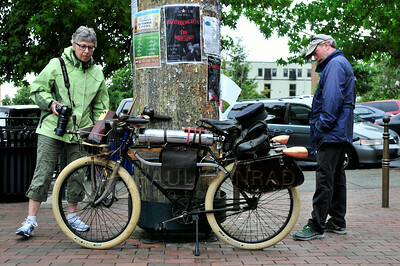 © Paul Conrad/The Bellingham Herald - Jim "Dirty Dan" Rich, left, and Valerie Snelling during the Fairhaven Steampunk Festival at Fairhaven Village Green in Fairhaven, Wash., on Saturday afternoon July 19, 2014. 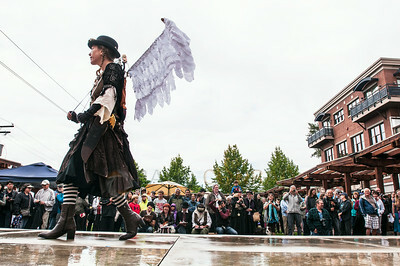 Hundreds enjoyed the sights of individuals dressed in Steampunk Victorian costumes, live entertainment, food and vendors . 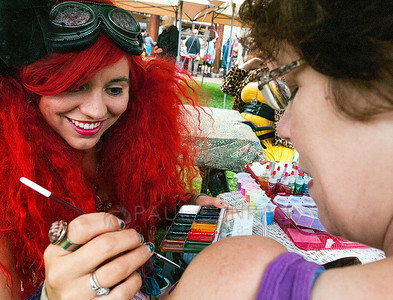 © Paul Conrad/The Bellingham Herald - Scenes from the Fairhaven Steampunk Festival at Fairhaven Village Green in Fairhaven, Wash., on Saturday afternoon July 19, 2014. 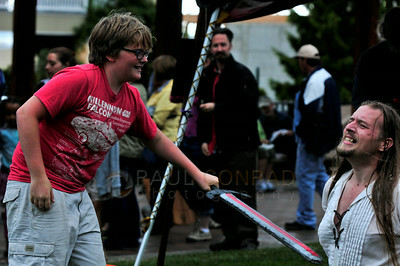 Hundreds enjoyed the sights of individuals dressed in Steampunk Victorian costumes, live entertainment, food and vendors . 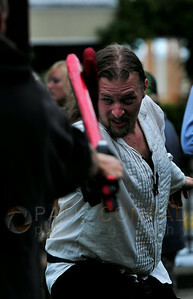 © Paul Conrad/The Bellingham Herald - Trevor Jones of Bellingham battles with Hayden Nupcharoen, left, of Bellingham, in an epic swordfight during the Fairhaven Steampunk Festival at Fairhaven Village Green in Fairhaven, Wash., on Saturday afternoon July 19, 2014. Jones says he has been making and playing with swords for over 15 years. 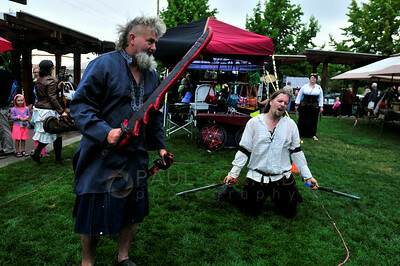 Hundreds enjoyed the sights of individuals dressed in Steampunk Victorian costumes, live entertainment, food and vendors . 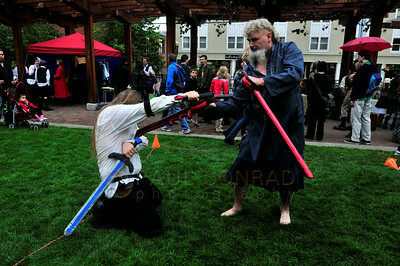 © Paul Conrad/The Bellingham Herald - Hayden Nupcharoen, left, of Bellingham, finishes off Trevor Jones, also from Bellingham, as they swordfight during the Fairhaven Steampunk Festival at Fairhaven Village Green in Fairhaven, Wash., on Saturday afternoon July 19, 2014. Jones says he has been making and playing with swords for over 15 years. 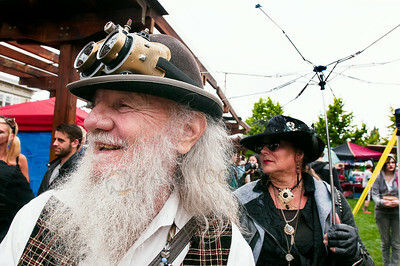 Hundreds enjoyed the sights of individuals dressed in Steampunk Victorian costumes, live entertainment, food and vendors . © Paul Conrad/The Bellingham Herald - Skull Shaw, left, and Trevor Jones battle during the Fairhaven Steampunk Festival at Fairhaven Village Green in Fairhaven, Wash., on Saturday afternoon July 19, 2014. 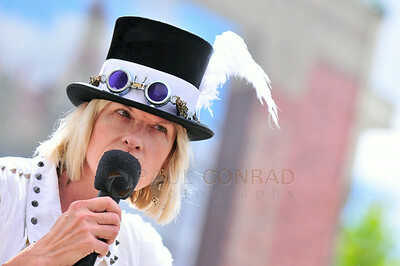 Hundreds enjoyed the sights of individuals dressed in Steampunk Victorian costumes, live entertainment, food and vendors . © Paul Conrad/The Bellingham Herald - Skull Shaw, right, and Trevor Jones battle during the Fairhaven Steampunk Festival at Fairhaven Village Green in Fairhaven, Wash., on Saturday afternoon July 19, 2014. Hundreds enjoyed the sights of individuals dressed in Steampunk Victorian costumes, live entertainment, food and vendors . © Paul Conrad/The Bellingham Herald - Inocencio Valderrama, left, and Laura Brisbane stop for a quick photo as they help out with the Fairhaven Steampunk Festival at Fairhaven Village Green in Fairhaven, Wash., on Saturday afternoon July 19, 2014. Hundreds enjoyed the sights of individuals dressed in Steampunk Victorian costumes, live entertainment, food and vendors . © Paul Conrad/The Bellingham Herald - Laura Brisbane announces the costume contest participants during the Fairhaven Steampunk Festival at Fairhaven Village Green in Fairhaven, Wash., on Saturday afternoon July 19, 2014. 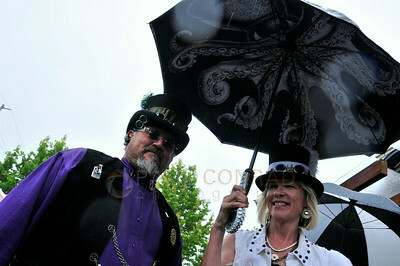 Hundreds enjoyed the sights of individuals dressed in Steampunk Victorian costumes, live entertainment, food and vendors .